The Start Menu of Windows 8 has been changed totally in the current version of Windows 8. The Older Microsoft versions had a long and useful Start Menu, however in Windows 8, Microsoft is trying to promote the new Metro GUI interface. The Start Menu in Windows 7 and older versions can be invoked by either pressing the Windows Key on keyboard or by clicking on Start Menu button of the Taskbar. The Taskbar in Windows 8 can be moved at either corner of the desktop by dragging it. In Windows 8 the traditional Start Menu is not present and Microsoft says that the next version of Windows 8 will have better interface for navigating on Desktop. 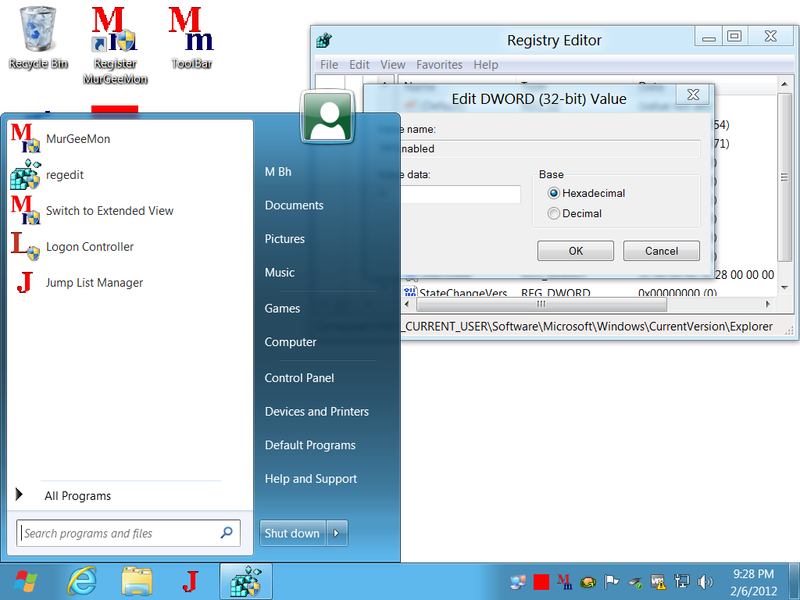 In case you would like to use the old start menu in Windows 8, there is a simple registry tweak as displayed in the above screenshot. 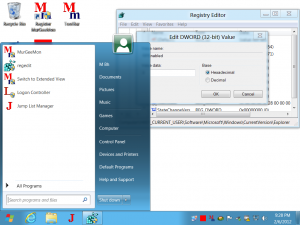 The Registry tweak can be used for the signed on user and once activated will invoke the traditional start menu on the press of the Start Menu button in Windows 8. On the press of Windows Key on Keyboard, the Start Menu will be displayed as well but the Metro UI will get invoked and will hide automatically as well. 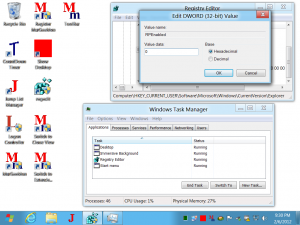 There is a downside of enabling the old start menu in Windows 8 using this registry tweak. 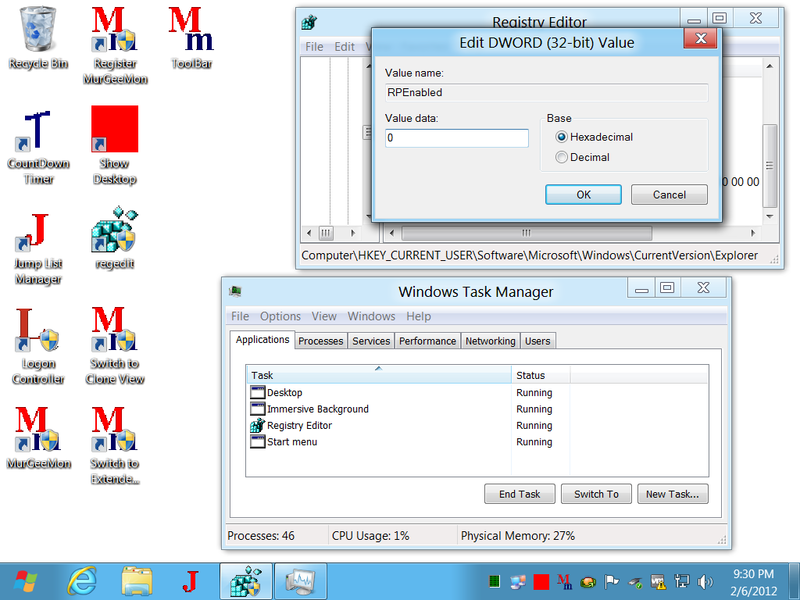 Once the Old Start Menu is enabled, the old Task Manager will get enabled as well and when you invoke the Task Manager, the old task manager will run instead of new feature rich Task Manager of Windows 8 as displayed below. In order to apply this Registry Tweak in Windows 7 to enable the Windows 7 style Start Menu and Windows style Task Manager, you would not need to sign off and sign in again. In case you are comfortable in handling the Registry Editor, switching between Windows 7 style interface and Windows 8 interface should be in a matter of seconds. In case you would like to see the Windows 8 the Metro UI style, all you need to do is revert abck the registry change and the brand new task manager of Windows 8 will appear next time you invoke the Task Manager and your Start Menu would be replaced by the Metro User Interface in Windows 8. Yes this version of Windows 8 is not a final version and the next version of Windows 8 may see improvements in the Start Menu and other Desktop Management graphical user interface. You can have a look at more Screenshots of Windows 8 and know what all new is provided by Microsoft in this new version of Windows 8. In case you do have a good internet connection and want to install windows 8 on your own computer you can Download Windows 8 totally for free from Microsoft Website. 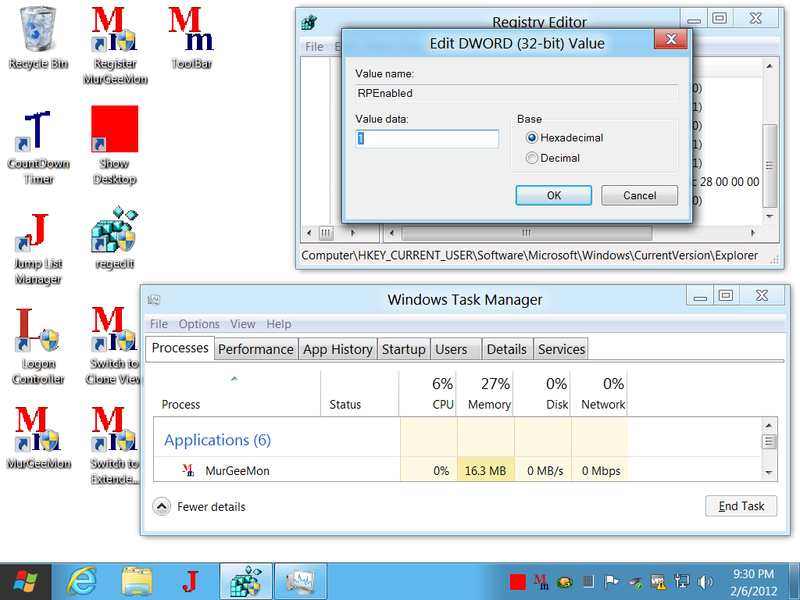 As new version of Windows 8 arrives, many more registry tweaks will be available and will be presented on this website.